Jaden Smith, the twelve-year-old son of Will Smith, stars in the title role of Columbia Pictures’ new action-adventure "The Karate Kid," a remake of the 1984 hit in which he plays an American youth in China who gets a crash course in martial arts from a maintenance man (Jackie Chan) so he can defend himself against a band of bullies. Will was a fan of the original "Karate Kid" and thought Jaden, who already had studied martial arts, would be the right guy for the role. "My dad had the idea of remaking it," Jaden Smith says. "He's the one who was like, 'We need to make this movie!'" 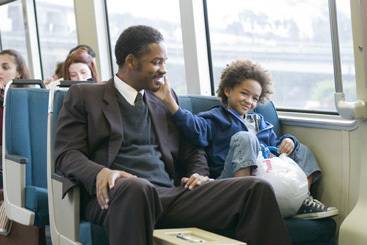 Jaden Smith got his big-screen start alongside his dad in the 2006 drama "The Pursuit of Happyness" and co-starred in the science-fiction remake "The Day the Earth Stood Still." He said he wants to make acting a lifelong career and take a page from his father's book with more action roles. Though he's not yet even a teenager, Jaden appears as dedicated to his craft as a seasoned pro, putting in the hard hours to make his character believable. For "The Karate Kid," he spent three months training in the martial arts in Los Angeles and then worked at it an additional four months in Beijing, where the film was shot last year. "Now, I'm doing it again," Jaden says. The film's title is a little misleading, to be sure, because Jaden studied kung fu rather than karate, but it's a skill that is serving him well. Kung fu, he explains, "helps me with stunts and stuff like that. It's great, and it's fun — but it's very hard work." This new "Karate Kid" plays to a younger demographic than the 1984 original, which starred Ralph Macchio as a bullied teenager who learns karate from a handyman/martial arts master played by Pat Morita. In the update, Dre and his widowed mother (Taraji P. Henson) leave Detroit when she is transferred to Beijing. Soon enough, the diminutive Dre finds himself the target of older and bigger bullies who are taking kung fu lessons from a sadistic teacher. Jackie Chan, in a surprisingly dramatic turn, plays the handyman at Dre's apartment complex, who teaches the boy the art of kung fu. The martial arts superstar also had a thing or two to teach the young actor — but not necessarily about kung fu. "It was more life things and things about the camera. He would come in every day and he would say ‘good morning' in a different language. It was very fun to work with him. He taught everybody things." The youngster's famous parents, executive producers on the film, accompanied him on the shoot, and though they were there for four months, he says he didn't get much time to sightsee. "What I did get to see was pretty cool," he says, looking on the bright side. "I got to run on the Great Wall." Relatively "fresh" in the movie business, Jaden was recently awarded the 2010 ShoWest Breakthrough Male Star of the Year. "Jaden is an exceptional young actor who has delivered a true breakout performance with his portrayal of Dre Parker in 'The Karate Kid,'" Robert Sunshine, ShoWest co-managing director. "I'm very excited about getting awards already. It's crazy," Smith answers when asked about the honor. Opened across the Philippines last Friday, June 11, “The Karate Kid” is distributed by Columbia Pictures, local office of Sony Pictures Releasing International. Visit www.sonypictures.com.ph to see the latest trailers, get free downloads and play free movie games.